Are you tired of wasting time and money on outdated financial processes? By eliminating the waste caused by inefficient, error-prone manual tasks, your company will realize a tremendous savings and significant payback with accounts payable automation. Traditional accounts payable processing rely heavily on invoices being shuffled back and forth between the finance departments and approvers. This back and forth causes a delay of invoices being approved and processed for payment in a timely manner resulting in higher than average processing costs, late payment fees and credit holds. ​Vision360 Enterprise accounts payable automation offers solutions that optimize the process of receiving, processing, approving, matching and integrating the payables process with ERP systems. Vision360 Enterprise creates a touchless, paper-free environment , eliminating error-prone processes, enforcing business rules and reducing costs. How Does Vision360 Enterprise Accounts Payable Automation Work? Your suppliers can submit invoices for payment directly into the AP Automation system or hard copy invoices can be converted to digital by scanning them using your existing equipment and/or mailed to one of our shared service centers where incoming invoices are converted to secure digital invoices each day. By utilizing Vision360's best-in-breed data capture technology and cross checking invoice data against your existing databases all captured data is verified for accuracy ensuring the highest level of data accuracy possible. Based on your specific invoice processing rules in Vision360 Enterprise, supplier invoices are automatically routed for review and approval by the appropriate staff member. If an invoice exceeds a users approval limit that invoice is then escalated up to the next authorized approver. To simplify the G\L coding invoices pass through a set of validation rules to ensure coding is correct the first time and auto-coding templates further enhance this process by eliminating the need for anyone to manually code an invoice. While Non-PO invoices might require someone on your staff to review and approve those invoices, the same is not necessarily true for PO invoices. Purchase Order invoices are automatically checked against your PO database and receiving files when the invoice arrives. Utilizing a series of cascading matching rules the Vision360 Enterprise system will attempt to auto-match PO invoices. Invoices that mis-match are flagged and sent to the appropriate personnel for review. Vendor and invoice data are systematically delivered and synchronized with your ERP system (SAP, Oracle, JDE, PeopleSoft, Lawson, Infor, Dynamics GP, QAD, Sage and more) providing full end-to-end process automation. By connecting the accounts payable process with your ERP system this eliminates the need for AP Staff to manually enter invoices into the accounting system further leveraging your ERP investment and maximizing your return on investment. Supplier invoices are instantly available st any computer for immediate access and review by authorized users. Vision360's archive means paper is no longer needed to be filed or stored because invoices are only a mouse click away! 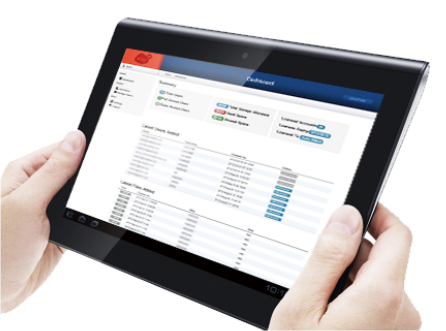 Vision360's dashboard and reporting provides instant visibility to every single invoice. This allows users to access the information they need to analyze key performance indicators and invoice progress to watch for problems before they occur. ​What do I need to purchase? Attend one of our webinars!